Google Calendar is great for reminding you of appointments. But if you have actions that must be done, you need something more than a one time reminder. I wanted to keep a list of actions with due dates where each day I would receive one email listing all the actions which were coming due, or overdue. Google Apps Script is a server side scripting language that interacts with Google Docs and other Google products. Among other things it can be used to add custom functionality to a Google Spreadsheet. I have used it to write a simple reminder service. This could be made more sophisticated with each action having a different owner that should receive a reminder. But it should serve as an example for someone just getting started with Google Apps Scripts to build on. Or for someone that wants to build their own reminder service. Create and name the spreadsheeet (I called mine "Actions"). You'll need two tabs. Call one "Actions" and the second "Closed". These will contain the list of open and closed actions respectively. Add a header row to each tab naming the columns: "Created", "Closed", "Due" and "Summary". The first three columns will be dates for when each action was created, when it was closed, and when it is due. The summary is the text that will be sent in the reminder email. You may want to add a few examples on each sheet and make sure that the dates are formatted correctly. // check that the user is on the sheet named "Actions"
When you save, you'll be prompted to name the project. Let's call it "Reminder Scripts". Now let's add the closeAction function to the spreadsheet menu to make testing it easier. Select this new onOpen function in the pull down list in the toolbar and click the run button. When you go back to the spreadsheet now you should see an "Actions" menu item. Click this and there should be a "Close Action" sub-menu. Let's test the closeAction function. Add a few example actions on the actions sheet, leaving the closed date blank. Click anywhere on the row of one of these actions and then click Actions / Close Action. The action should be deleted automatically. When you switch to the closed sheet you should see this action has been added with today's date. So we have sheets with our open and closed actions, and we have a menu item to mark an open action as closed. Now let's get to sending reminders. Add the following function below the onOpen function in the Script Editor. Make sure to change the email address at the top of the function. You'll also need to add this function which is used above. This calculates the number of days between two dates. Now make sure there are some actions that are overdue or within 5 days of due. Click Actions / Send Reminders. The first time you do this, Google will present a popup asking that you authorize the function. This is because of the use of MailApp. Go ahead and authorize. Now you'll need to click Actions / Send Reminders. This time you should get an email with all the due reminders. From the Script Editor click Triggers / Current Script's Triggers... and click Add a new trigger. 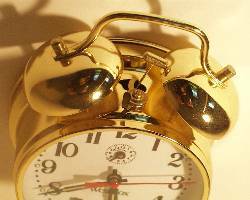 Select sendReminders, Time Driven, Day timer, 5am to 6am. This will cause sendReminders to run once each night between 5am and 6am. That's it. You should now have a working reminder service built using Google Apps Script. You can enter in all those actions and receive a simple email reminder of all the due ones every day. Remember, it will keep reminding you about an action until you open the spreadsheet and mark the action as closed. That's what the link in the email is to help with, and the Close Action item in the Actions menu. Even if you're not looking to build a reminder service, hopefully this post will serve as a useful example of some of these capabilities of Google Apps Script. Post a comment to let me know if this is useful. If you have trouble with it, post a comment and I'll try to help. Fantastic...This is what I dreamed to have such a script. Closed script runs without error but items in the Action sheet is not moving to the Closed sheet. Thanks really ..May the Almighty God Bless you. Peace be upon you. Thanks.. It worked for me the Closed function after i change the name of the sheet from Actions to actions. sacosana - thanks for the feedback. I've corrected the case on the "actions" and "closed" sheets in the functions above (now "Actions" and "Closed" to match the instructions). I've also added a comment to explain that DaysLeft() is a function that calculates the number of whole days between two dates. I'm not sure why you're seeing a TypeError. Perhaps there is a row in your actions sheet that has a corrupted date? Thanks for the Script.It works fine. but It gives an Error as follows when there is no date available in "Due"
My case, the "due column" will be filled only later depends on other criteria. But without date on due column it gives the above error. Just because of one row where the due dates is not filled I will not get reminder even though "due dates" are filled for other rows for different cases. Please help in resolving this. I haven't tested this. Let me know if it works. Thanks Mr. Alex for the "If statement." It works only if I remove the following script. How to have both running. The second problem is that We should get reminder mails only if there is something to be reminded. But for an incident even if everything is closed we get a blank reminder mail with just Title, Summary and Due. Hello Mr. Alex. Good day. It works perfectly for me after adding the script for the blank due column. ( skiping if the due columnn is blank).I have added after the skip action that closed. Perfect. Yes. I too need a script to be added to avoid getting blank reminder if actions are closed or if the date is not yet due. Reminder mail shoud come only if there is something to be reminded. Please help. Please help in getting the script to avoid getting blank reminder if actions are closed and also if the date is not yet due. Reminder mail shoud come only if there is something to be reminded. Please help. Thanks for this script! How would I tweak the script to send reminders to multiple email recipients? simply fantastic! thank you for making it so simple! Getting the following message (TypeError: Cannot find function getTime in object ) after changing the onOpen code. Also, "Send Reminders" does not appear on the drop-down menu under "Actions." Sounds like a typo somewhere. Perhaps the name of the date variable (date1 or date2) is spelled differently between the function signature and where getTime is called on it? I can't see any errors. A few questions. When you close and open the spreadsheet, do neither the close action nor send reminders items appear in the menu bar? Can you check that there are no invalid dates in the spreadsheet? It occurs to me that the typeerror you are seeing would happen if the function read a cell that didn't have a date in it and then tried to call getTime. Even a blank line in the spreadsheet could cause that problem. Hi, Alex—Close Action and Send Reminders both appear, but when I click on a date cell in any of the active columns and try to send a reminder, I get the same message as before: TypeError: Cannot find function getTime in object. This is all that's in the Actions tab of the spreadsheet. Sorry for the bother. I'm sure I must be overlooking something obvious. Many thanks! I think the problem is those two rows with "Get on it." and "Now.". It looks like those are in rows 2 and 3 and that they have no dates. So either you have left the date fields blank or you have put the text in the date column. Either way it's going to cause the sendReminders function to fail, because it expects to find valid dates in all cells of column A except the header. If you delete rows 2 and 3 it should work. Thanks. This is awesome. I know this is years too late, but may I ask one question? Is there any way to have one reminder (row) go to one email address and another reminder (a different row) go to another email address? Let me see if I understand what you're looking to do. Are you thinking of adding a new column to the Actions sheet, so that you have the headings: Created, Closed, Due, Summary, Email. And then you want one reminder email per row in the Actions sheet, with it being sent to the address in the Email column for that row? If I misunderstood what you're trying to do, let me know. Hey I need some help with an error about the following - TypeError: Cannot call method "getTime" of undefined. (line 83, file "Code") I am stuck and dont know what to do to make it work? Typically this happens if there is a row in the spreadsheet without a valid date in the due column, can you try removing rows in the spreadsheet until the problem goes away to isolate which row might be causing it?